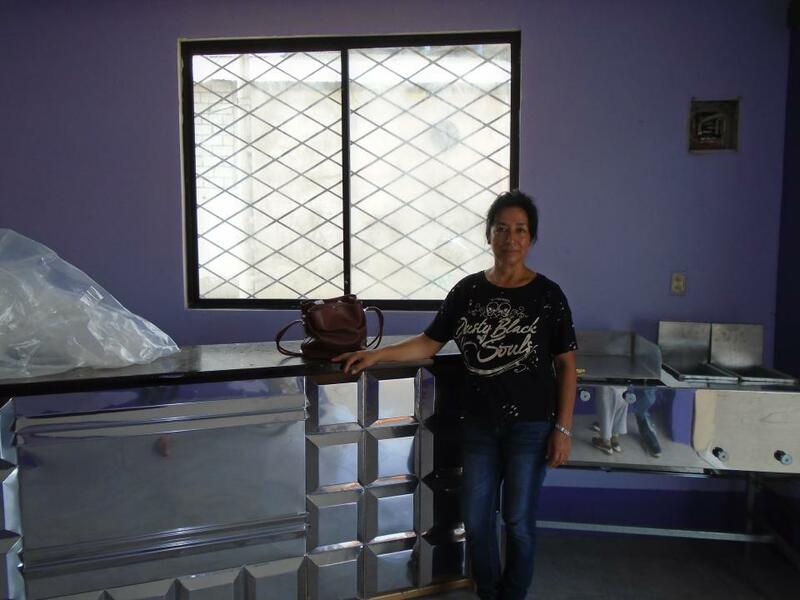 A loan of $2,425 helped to open a restaurant and buy tables, raw materials and the utensils she needs to grow her small business. Santo Domingo is where Yolanda, 53, now lives with relatives after giving her home to a son to start his own business which is going very well. More than a year ago Yolanda returned to her native country, Ecuador, after living in Spain because of the labor market. There she cooked in restaurants and acquired a lot of experience. She lived alone and sent money back to her children to fix up the house. But she also kept saving because she wanted to return home and start her own food business. Over a year ago she started realizing her dream and now lives with family. She already has bought a range to start her business. She approached Fundacion Alternativa because she lacks capital to start her restaurant. She has the location and has bought a counter and range but she needs tables, raw materials and other utensils. With the loan, Yolanda can achieve her goal. She is happy because she can buy everything she needs to become a small business owner. She is grateful to KIVA for the support given to people who do not have the money to start a business although they have a large dream and the determination to get started. En la ciudad de Santo Domingo vive Yolanda, una señora de 53 años. Vive en casa de familiares ya que su casita propia le dio a un hijo para que emprenda en su propio negocio al mismo que le va muy bien. Hace más de un año Yolanda volvió a su país natal Ecuador ya que vivía en España por falta de trabajo, allá se dedicaba a cocinar en restaurantes donde adquirió mucha experiencia; vivía sola y enviaba todos los meses dinero a sus hijos para que vayan mejorando la casita. Aun así Yolanda al igual seguía ahorrando porque tenía la esperanza de volver a su país natal y ponerse su propio negocio de comida. Ya hace más de un año pudo hacer parte de su sueño en realidad, ahora vive junto a su familia, y ha comenzado a adquirir unas cocinas para empezar con el negocio. Acudió a Fundación Alternativa ya que le hace falta capital para poder iniciar con su local de comida, ya ha adecuado el espacio, ha comprado un mostrador y una cocina, pero necesita para mesas, materia prima y demás utensillos, con este crédito Yolanda podrá hace su sueño realidad. Está feliz porque ya podrá comprar todo lo necesario y así ser una microempresaria. Agradece mucho a KIVA por el apoyo que brindan a las personas que no tienen el dinero para emprender el negocio pero si tienen un gran sueño y las ganas necesarias para iniciar. This loan is intended to help Fundacion Alternativa borrowers to start their own businesses. As part of the loan package, Fundacion Alternativa provides clients with training sessions, guidance to develop their business plan, access to a customized credit facility and monitoring sessions during the first three months of their venture following the loan disbursement. Given that this product is designed to fit the needs of start-up entrepreneurs, these loans require typically higher loan amounts and longer grace periods, making Kiva’s flexible and risk-tolerant funding crucial. By supporting this loan, you are helping an Ecuadorian entrepreneur to access critical capital as they begin to build their own enterprises.